This description provides information of ancient sites, seaside resorts, churches, monasteries, landscapes and small towns and villages. Additional details can be found in various books printed on Greece, such as the 'Blue Guide to Greece.' The names of places conform to the accented Greek pronounciation which would be the one a traveller would face upon a potential visit. For a general map of Peloponisos, click here!(40K). 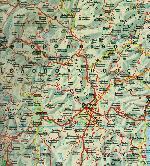 For a map of the Arkadia area, click on map above. 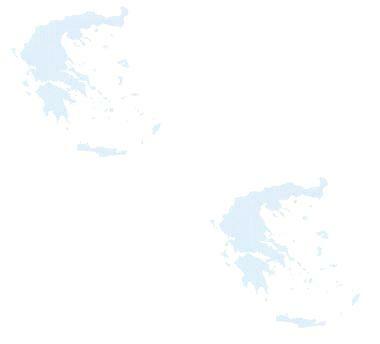 To go back to the Peloponisos main page, click here! One of the most beautiful villages in the area found within a large pine forest. A village, 800 meters (2400 feet) up on the Trahi mountain, where women still make cotton using spinning wheels. Many other local traditions remain, including houses built in a typical mountain style using wood. The capital of Arkadía and the second largest city, both situated at an altitude of 650 meters. In the center of the town are nice parks and many typical wooden houses. 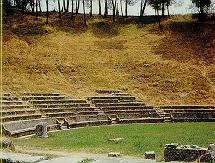 Megalopolis has also an ancient theatre still in use during the summer. This is the site of a very clear mountain water spring forming a small lake leading into a river. Easter Friday (according to the Greek calendar - different from the Western Calendar - see Greek Events) is a special date because many locals throw "panigiria" (fairs) here. Archaeological site near the sea, site of neolithic settlements. 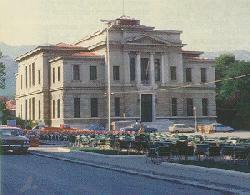 Many artifacts are at the Archaeological Museum of Argos. A very pretty site of a Byzantium city which had (according to tradition) 365 churches, one for every day of the year. Only one church is standing and in use: Panagia (Virgin Mary). Dimitsana and Stmenitsa are two representative Arcadian towns, situated at altitudes of 1000 and 1100 meters respectively. 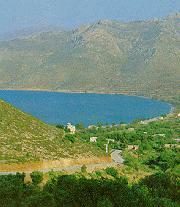 The houses are beautiful, the crafts are great and the views are superb. From Stemnitsa, one descends to the Monasteries of Prodromos and the site of Ancient Gotrida with its well preserved ruins (open to all ; hard to get to, only gravel road). One of the most important cities in Ancient Arcadia, today the site of ruins of the temple of Alea Athena, parts of which are still standing. Also found in the area are Byzantine mosaics. Mountain village, north of Sparta situated at an altitude of 900 meters (about 2800 feet). On the same site used to be, in ancient times, a town of a similar name, whose temple of Karyatid Artemis was well known. It is due to girls dancing around this temple, that the Karyatides were sculpted on columns adorning the Acropolis of Athens. The village and many near it, are situated in spruce forests. 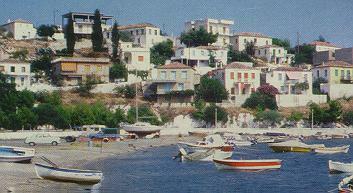 A lovely village full of white washed houses reminiscent of Greek islands' towns. Its church is built on ancient foundations. 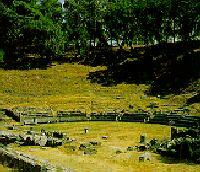 It is alleged that in this village was also situated the house of Herodus Atticus. 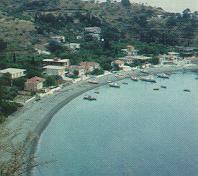 A village near the Saronic gulf with a beach by the same name. Here textile yarns are still produced with cotton wheels, the same traditional way used many years ago. 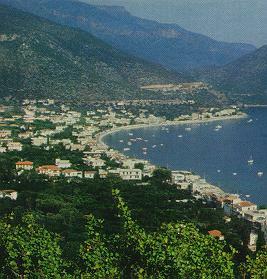 One of the prettiest seaside town in the whole Peloponese. It is rather touristy in the summer, full of hotels and restaurants/taverns.